COUNCIL BLUFFS, IOWA – The Council Bluffs Interstate System (CBIS) was originally constructed in the 1960s and was developed to the design standards of that time. Although routine maintenance projects were completed in the 1980s and 1990s, there have not been any significant changes to CBIS since its original construction. In 1997, the City of Council Bluffs and Metropolitan Area Planning Agency conducted the Council Bluffs Interstate System Needs Study. Completed in 1999, the study indicated that many of the interstate’s features are outdated and do not meet today’s design standards, guidelines or operational criteria. Additionally, the current system lacks adequate travel capacity. In 2002, the Iowa Department of Transportation (Iowa DOT) initiated the Council Bluffs Interstate System Improvement Program to address the issues raised by the CBIS Needs Study and develop solutions for improving the interstate system in the Council Bluffs metro area. The solution is the CBIS Improvement Program, a multiyear, multibillion-dollar effort that will result in reconstruction of most of the Council Bluffs Interstate System. The CBIS program is focused on improving Interstates 80, 29 and 480 within the metropolitan area. This comprehensive interstate redesign will modernize the highway system and improve mobility and safety of approximately 18 miles of interstate. It is the single-largest project currently in the Iowa DOT's five-year Transportation Improvement Program. In 2013, Iowa DOT selected HDR—and its long history of working with CBIS—to provide Program Management and General Engineering Consultant (PM/GEC) services for the CBIS Improvement Program. The program is being implemented in manageable projects over multiple years with projects prioritized by available funding and which have the most significant impacts to traffic management, safety and vehicle capacity. 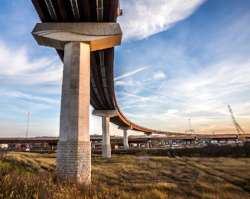 As part of that program, the CBIS East System Interchange Bridges Project will address capacity needs, improve safety, and correct functional design issues associated with this interchange and the South Expressway/IA 192 interchange. Following an extensive public participation process, the project for this key transportation corridor includes five bridges totaling over 8,800 feet in length, has many complexities, and requires coordination with various railroads and other stakeholders. The bridges were opened in October 2017 and overall construction is expected to be completed in early 2018. Firm: Kirkham Michael & Associates, Inc. The recently constructed extension of E. Martin Luther King Jr. Parkway from SE 15th – SE 30th Street marks a large milestone in the progress of the City of Des Moines E. Martin Luther King Jr. Parkway project. The completion of this project allows efficient access through the City of Des Moines on Martin Luther King Jr. Parkway from Fleur Drive, all the way to SE 30th Street. Planning for this project began in the 1970’s and has steadily progressed since 2005. After three years of construction, this new section of roadway was opened for traffic on May 20, 2016. The City of Des Moines retained Kirkham Michael to complete the design and construction management of this two-mile, $30 Million dollar street extension, which is the sixth project of the E. Martin Luther King Jr. Parkway plan. This new section of roadway includes over three-miles of new street paving, on-street bikes lanes, a parallel recreational trail, the expansion of Dean’s Lake, and two railroad overpasses. The dual railroad overpasses allow traffic to avoid conflicts with the Union Pacific and Norfolk Southern Railroads, which frequently blocked east-west streets in this section of town. The project also included interconnected traffic signals at SE 18th, SE 23rd, SE 25th, and SE 30th Streets to keep traffic moving efficiently. One large benefit of the roadway project is the installation of a storm sewer network, which never existed in most areas of the project corridor. The new storm sewer along the project will allow adjoining properties to redevelop and connect into the City storm sewer network. Due to the large cost of the project, only the south two lanes of the four-lane boulevard were constructed, but all other utilities were completed for the ultimate project build-out. The entire corridor was also landscaped with trees, shrubs, native grasses, and way-finding monuments to enhance the corridor aesthetics. This project received statewide, and national attention when it won a competitive Transportation Investment Generating Economic Recovery (TIGER) and Revitalize Iowa’s Sound Economy (RISE) grants to assist in funding construction. The role of the adjacent business Kemin Industries was vital in receiving the RISE grant, and they have expanded rapidly along the roadway corridor leading the redevelopment trend in this corridor. The project also received national attention when the serving United States Secretary of Transportation Anthony Foxx visited the project in 2015. Project: Martin Brothers Distributing Co., Inc.
Client/Owner: Martin Brothers Distributing Co., Inc.
Firm: The Schemmer Associates, Inc.